Here is where we need help with at the moment. The big push for the station this next six months is making sure the people of Amber Valley know they have their own radio station. 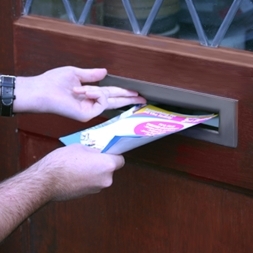 We need people like you that fancy a bit of exercise to deliver leaflets door to door. You can deliver in your own area, anything from one street to a whole town or even more. Help your favorite station and get some fresh air at the same time! We have street maps so we know which areas are already done. To help us get the word out there is no need to fill in an application form, just call us on 01773 513107 and ask for Emma or Chris. We can bring you some leaflets or you can come into the station, have a tour and pick some up at the same time. We have a vacancies for programme researchers to work across the station in a variety of roles. Radio programmes need content preparing for broadcast. Fron the compilation of this weeks top 40, to competition features or information on various subjects for presenters to read out. You could even end up on the streets of Amber Valley with a microphone asking people their opinions! Researchers also arrange for guest interviews for shows such as The Afternoon Show with Trevor Middleton and would supply content for Trevor to interview with or just liaise with local organisations and guests. If you are interested in this position then please download our application form, fill it in and return by email to chris@ambersoundfm.com or post to the station address. We need bright bubbly people to form a promotions team at Amber Sound 107.2FM. Help out your local station by giving out leaflets in supermarkets, standing in busy town centres giving out car stickers or walking around the streets of Amber Valley popping leaflets in doors. If you are interested in this position then please download our application form, fill it in and return by email to sales@ambersoundfm.com or post to the station address.